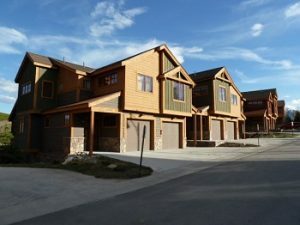 Rolling Ridge Townhomes are newly completed townhomes located at the base of Wildernest in Silverthorne Real Estate. Construction on these Silverthorne townhomes for sale started in 2007 with the last building finished in 2013. There are 20 total Rolling Ridge Townhomes with 3 or 4 bedrooms ranging in size from 1,934 – 2,147 square feet. Each property comes with an attached 1-car garage. Each of these Silverthorne townhomes has 3 floors with decks off the main floor living room and fenced patios with space for a hot tub off the lower level. Rolling Ridge Townhomes are beautifully finished typically with slab granite counters in the kitchen and bathrooms, beautiful tile backsplashes, wood floors, in-floor radiant heat, alder trim and doors, stainless steel appliances and more. Some owners were able to chose their own finishes making each Rolling Ridge townhome unique. View the Rolling Ridge Townhomes for sale in Silverthorne below or contact Justin and Krystal Knott with LIV Sotheby’s International Realty to arrange a showing of these beautiful Silverthorne townhomes or other Summit County Real Estate.